Name the book in the Bible consisting of a five chapter poem of laments. Basketball, volleyball, track and field competition, arts and crafts shows, a cross-continent bicycle trip - all of these, and more, are offered to teenagers in the Worldwide Church of God through Y.O.U. - Youth Opportunities United. This month Y.O.U. observes the completion of its first full year of activities and events for Church youth. 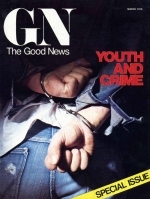 But the concept of youth programs is hardly new to the Church. Herbert W. Armstrong has long recognized the importance and value of properly educating youth, and providing constructive, challenging opportunities for adventure and personal growth. To train young adults to be future leaders in the Church and community, he established Ambassador College in 1947. In the early 50s Imperial Schools extended the educational program of the Church to the grade - and high-school levels.